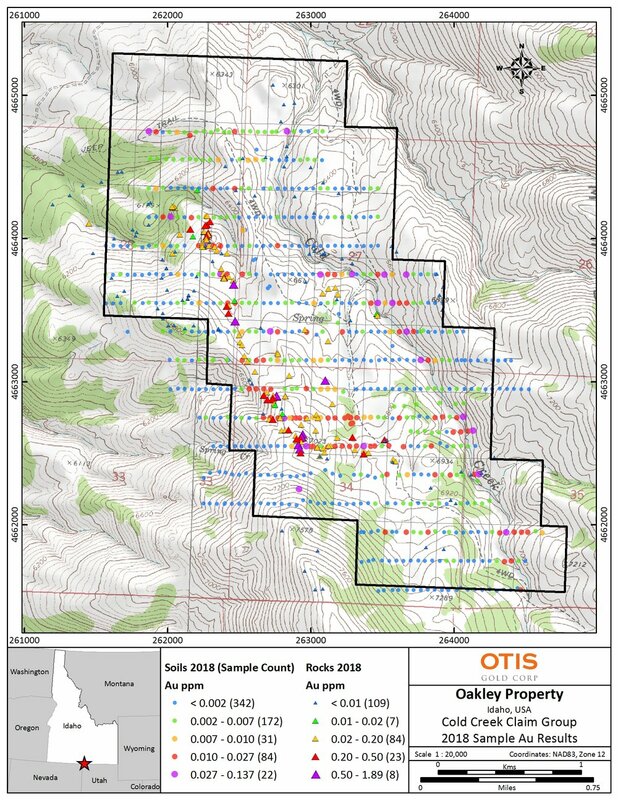 Otis Gold Corp. (“Otis” or the “Company”) (TSX-V: OOO) is pleased to announce the results from its recently completed 2018 exploration program at Cold Creek, a target located at the north end of the Oakley Project, Cassia County, Idaho. Surface geochemical studies consisting of rock outcrop mapping and sampling, and a 200 metre (“m”) by 50m soil sample grid, has revealed a 3.5 km long by 0.5 km wide trend of anomalous gold and silver values (Figures 1 & 2 – Au & Ag rock and soil sample result maps). Assay results from rock chip samples include gold values up to 1.9 g/t gold (or “Au”) and silver values up to 8.4 g/t silver (or “Ag”). After analyzing these results, Otis expanded its Cold Creek claim package by locating 32 new federal lode mining claims (totaling 640 acres) (Figure 3 - Land Tenure map). Geochemical and structural data collected from the 2018 field season, along with historic reverse-circulation drilling data, is being modelled in 3D in order to develop drill targets for future testing. The Cold Creek target contains gold-silver epithermal hot spring-type alteration and mineralization. This is predominantly hosted in the Tertiary Salt Lake formation (or “Tcg”), a series of epiclastic sedimentary rocks, ash layers and tuffaceous volcanic rocks. The Tcg underlies the majority of the Cold Creek property and composes the primary target for exploration in the Cold Creek area. • A total of 651 soil samples were analyzed for gold and silver. Results show an anomalous zone or ‘core’ to the Cold Creek target within the Tertiary Salt Lake formation tuffs and conglomerates that indicates the potential for sub-surface Au-Ag mineralization. The anomalous zone is defined by gold values up to 0.14 g/t Au and silver at 1.13 g/t Ag. • Soil results also show a strong anomaly along the fault-controlled Cold Creek drainage to the East. This fault may host mineralization and indicates potential expansion of the anomaly to the East. • 231 rock-chip samples were collected across the project area and contained up to 1.9 g/t Au and up to 8.4 g/t Ag within the altered and oxidized ash and tuffaceous matrix of the Tertiary Salt Lake Formation conglomerate (Tcg). Results have confirmed that the Tcg is the principal host for mineralization within the Cold Creek claims. • As a result of insights gained during the 2018 field season, Otis has expanded its land package at Cold Creek by 32 claims (640 acres). geochemical sampling programs. Additionally, a LiDAR survey planned for 2018 and designed to assist in identifying fault structures will now be completed in 2019. 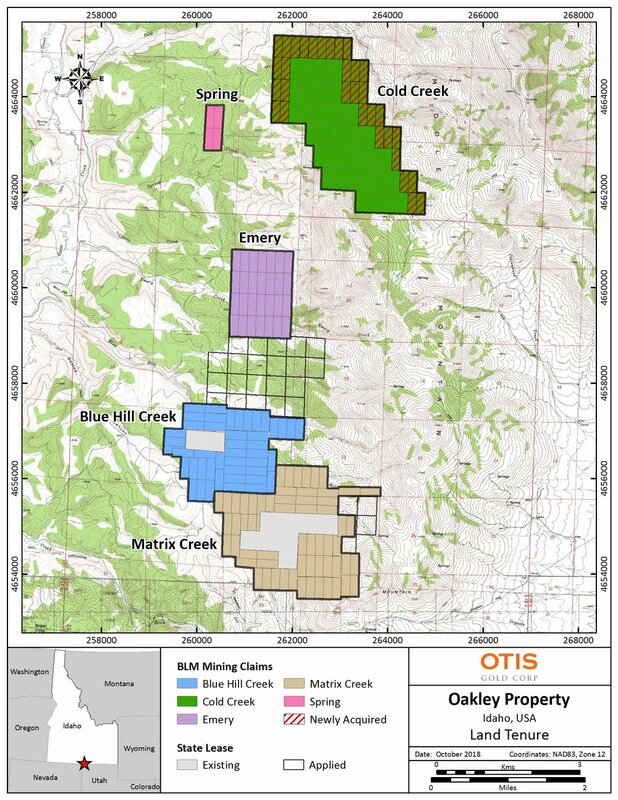 The 2018 exploration work at Cold Creek continues Otis’ commitment to further advance the Oakley Project, and ties in to the field work completed at both Matrix Creek and Blue Hill Creek in 2017 (see Otis Gold News Release dated May 3, 2018). Exploration in late Spring-Early Summer 2018 consisted of geologic and structural mapping, and the collection of 651 soil samples and 231 rock chip samples. All samples were analyzed by Bureau Veritas Minerals laboratories in Elko and Reno, Nevada using 30g Fire Assay for Gold in rock samples, and 37 element ultra-trace ICP-MS analysis after modified Aqua Regia digestion for rocks and soil samples. Alan Roberts, MSc, CPG, and Vice President of Exploration, serves as the Qualified Person for this news release and has reviewed and approved the technical content contained herein. The Oakley Project (“Oakley”) is a gold-silver exploration prospect located 21 km south of Oakley, Idaho, and 3 km north of the Idaho-Utah state line, and along trend from the Vipont Mine in Utah 11kms to the south. The property lies along the western flank of the Albion Mountains, part of the Albion-Raft River-Grouse Creek Metamorphic Core Complex. Oakley contains multiple targets located along a trend greater than 10 km in length and comprises the Cold Creek target to the north, and the Emery Creek, Blue Hill Creek and Matrix Creek targets located to the south of the project (Figure 4 - Regional Geology map). Oakley hosts gold-silver, epithermal hot spring-type mineralization at multiple targets that are all associated with regional detachment-related gold-silver mineralization. Blue Hill Creek (Technical Report dated August 8, 2016) contains an Inferred Resource of 163,000 ounces gold in 9.97 million tonnes at a grade of 0.51 g/t Au. The Blue Hill Creek resource is hosted within a northwest-trending Tertiary graben that is part of a north trending, 8 km long by 1.5 km wide zone of low-sulphidation, hot spring-type gold occurrences along the western margin of the Albion Mountains.